Wrap-It Heavy Duty Storage Straps are the easy and professional storage solution. 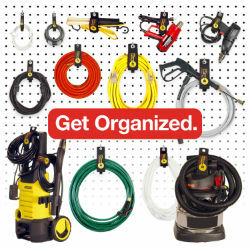 Simply wrap and store extension cords, rope, jumper cables, power tools, appliances, ski rope, garage vacuums, garden hoses, Christmas lights, garland, hanging ladders. The Wrap-It counter display comes packed with 12 each medium, large, and extra large Heavy-Duty Wrap-It Storage.